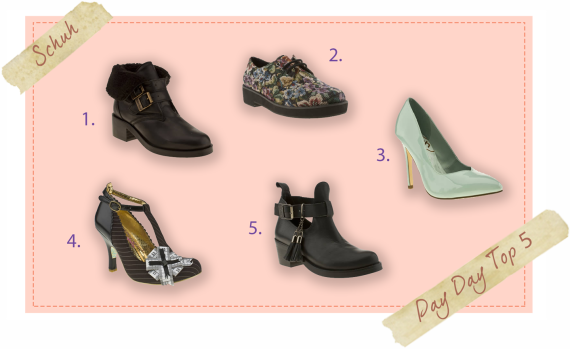 Here is my Schuh Pay Day Top 5 list! Now it’s friday I’m starting to think about what to spend my money on. Here is a few of my favourite items that I have seen at Schuh. Schuh always have a fantastic selection of different, high quality shoes available. First I have started the list with the zig zag boots. The zig zag boots are strong and sturdy and will be a great investment coming into the winter months. Secondly I have included lace up tapestry flats. I love all floral print and why should shoes be any different? These look fab with a real vintage, old school feel whilst being low heel and comfortable. Third are the Sweetheart high heels, currently reduced from £48 these shoes are now only £19.99! The pastel tones are gorgeous and are ultra feminine by the inner sweetheart shape. Forth I have listed Irregular choice high heels. Irregular choice is a great brand, one that I have always loved. This pair of high heels are fantastic for adding a bit of interest to an office outfit with the pin stripe detail. I conclude with the helter skelter boots, a fantastic pair of statement cut out boots that are strong and will be right on trend this autumn.